Our homestead was purchased at such a great price in part because of all the work it needed. Most people could not look past the field of thistles, itch weed and cocklebur bushes. To be fair some of them stood between six and eight feet tall so it was a difficult thing to do. As we have moved forward with our homestead clean up, I have found a few tools that I simply could not have done without when it came to our clean up. If you have never tried to clear ground before here are a few tips that will help you out. I know that probably sounds crazy but it really does work! I am fortunate enough to have a friend that raises several goats so when he weaned his kids he brought me four of his moms. We have had them here on the homestead for about two weeks now and they are really clearing the ground. 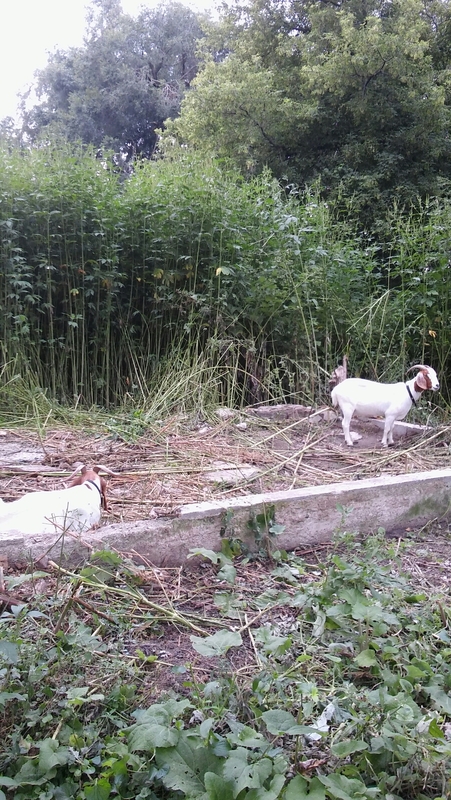 They eat so many different weeds which makes my clearing job much easier. Word of caution though, they are very troublesome critters. On several different occasions they will break their chains, pull up their stakes, or simply get tangled up. They take some work but they really do help so give them a try. Weed eaters are such wonderful machines. Although they are not the lightest thing in the world for a smaller person like myself, they are amazing at cutting down brush in those hard to mow areas. We have been using ours regularly as we try to create a more inviting and less overgrown driveway. Having the ability to quickly zip around trees and landscaping gives you back a bit of time. Knowing you can use your weed eater allows you to zip past cumbersome mowing places and keep moving at a good speed. I’m sure not all homesteads are found this way, but ours has come with several piles of rubble from who knows what. It is a daunting task when you look at it from a sorting standpoint. I have tried previously to go through and only throw what was absolutely necessary, burn or recycle the rest but it was extremely time consuming. My latest strategy is to take a small section each week to just pick up and really clear out. It is a deep clean and instead of wasting time sorting I am filling our dumpster to the max. Our place has a lot of old farming related items that are broken and unusable. Glass and nails have been my biggest obstacle. If you know of any great ways to find them in the dirt, please let me know. I love my pruning loppers. They are absolutely worth every penny we paid for them (they were about twenty dollars). These are really a versatile tool for me. I am not as strong as Sir Swine so these allow me the extra force I need to be able to cut something on my own without a larger tool. Our pruning loppers have been used to prune all of the trees around our driveway and yard. I have also used them to cut down cocklebur bushes as the summer has progressed. Thistles don’t stand a chance when you have these. When you have weeds that grow as tall as ours have you need something to get in at the ground level. I have been using these to cut buckthorn, rag weed and anything else in my path at the ground level so we will have a nice level area to mow. Often times in the country we are a bit more lax in our chore of mowing. Our grass gets a little longer but not bad by any means. I have found since spring that if you really want to stay on top of cleaning up your property you are going to have to mow and mow regularly. Honestly, I would put it down as a weekly chore. We have two mowers at our place, a riding mower and a much smaller push mower. The push mower was purchased with the intent of using to really start bushwhacking through some of those lesser known areas that we did not feel comfortable sending the riding mower. Our riding mower is used to really get the job done and save us a bit of time and energy. Mowing regularly can be a challenge but it is something you have to do no matter what. Our riding mower broke a part of the deck a few weeks ago and while I waited for the parts to come in so Sir Swine could fix it, I had to push mow the entire yard. 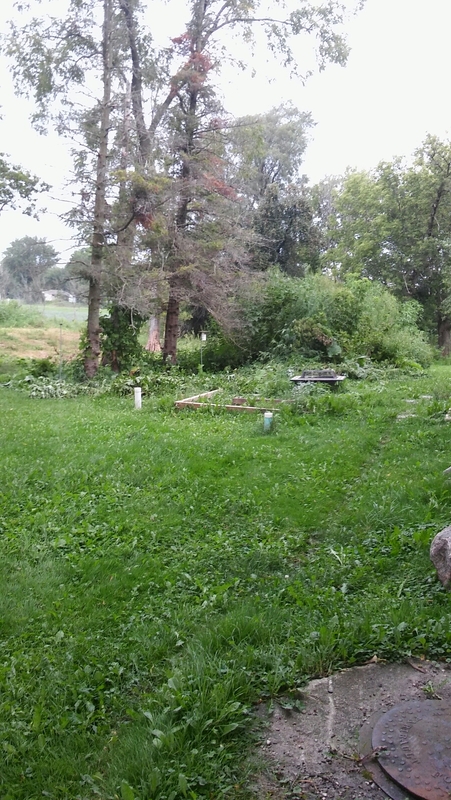 We have a pretty good sized yard so let me say this is no small task. I push mowed for over five hours, but the job was done. As always with your homesteading journey, you will get out what you put into it. 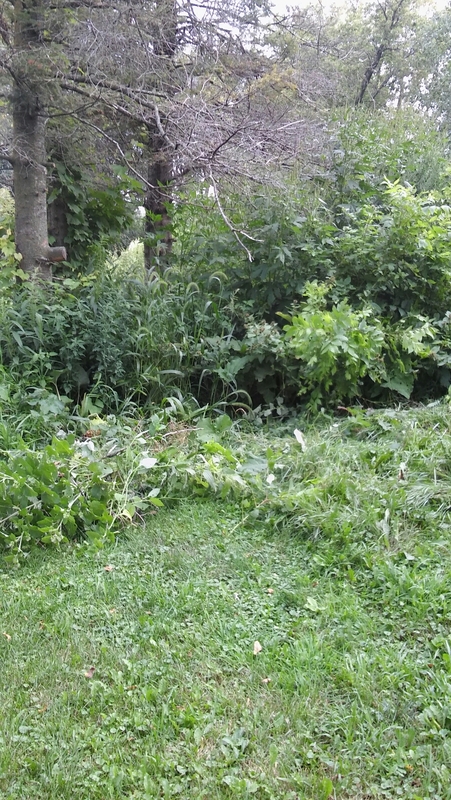 I’m not going to tell you that clearing ground is an easy task, especially when the weeds grow back so quickly. Remember to look around at the end of every day and see the progress that you have made. The big picture, this is your homestead.